When creating the course, we took into consideration course beauty, historic features, elevation gain, crew accessibility, aid station optimization, and the overall interaction of the ultra runners during the event. The 100K boasts about 13,000 feet of elevation gain while the 50K has about 6000 feet. As we’ve done since the days of the Quicksilver 50 mile endurance run, the 100K course utilizes the neighboring Sierra Azul Open Space that guides you higher and deeper into the Santa Cruz Mountains and into Los Gatos. We’ve broken this course description down into Aid Station to Aid Station sized chunks. Some of these chunks will not apply to the 50k runners, and are noted below. All runners are required to have a light source at start of the race. The course begins with a moderate climb up to English Camp, past the San Cristobol Mine to the top of the Mine Hill, before a short descent to and around the Hidalgo Cemetery. Most of the trail so far is on fire road and double track, so you won’t have to worry about jockeying for position. After climbing back out of Hidalgo Cemetery, you will then head west towards Sierra Azul Open Space and your first Aid Station at Hicks Road. Upon leaving the Hicks Road Aid Station, you will cross into the Sierra Azul Open Space Preserve. Perched on top of the mountain is the Mt. Umunhum “cube”, a remnant from the Almaden Air Force Station which operated from 1957 to 1980. Park officials won’t yet let us take the race up this popular summit, so we’ll tackle an adjacent summit instead. The race will take a fire road trail that rolls gently upwards for a couple of miles, before getting progressively steeper and rougher as you get closer to the summit of Mt. El Sombroso. Shortly after reaching the summit, you will get a brief chance to take in an expansive view of the Silicon Valley, with views on a clear day of Mt Hamilton and sometimes Mt. Diablo or Mt. Tamalpais. After about half a mile of downhill rollers, you will arrive at the Woods Road Aid Station, captained every year by the Birthday Boy, Loren Lewis, and his team of ultra-running veterans. After all that climbing it might be tempting to linger for a while at the aid station, but once you grab a drink and a snack, it’s time to stash the climbing legs for a bit and get ready to descend. It’s about five and a half miles predominantly downhill, but don’t get fixated on the sweeping views. There are still plenty of trail gremlins waiting to grab a toe and send you airborne. At the end the descent, you will reach the end of the trail and will take a left turn onto the asphalt for about a quarter mile around Lexington Reservoir to the Lexington Aid Station. This road can be popular with weekend warriors, so please run single file on the shoulder of the road and be alert for cars and cyclists. Before leaving the Lexington Aid Station, please make sure that you have ample liquids and calories. The next stretch is long and strenuous! You will quickly find yourself climbing again, this time up the officially named Priest Rock Trail. You may want to say your prayers! Half way up the climb you will encounter the unofficially named Dog Meat climb which gains about a thousand feet in a mile and a half. At the top of Dog Meat, you’ll reach a T in the trail, where you will turn left to descend 4 miles to the Kennedy Road Aid Station. The Kennedy Road Aid Station is the first cutoff of the race, so please make sure that you leave the aid station by 11:30. Hopefully you enjoyed the descent, because now you need to turn around and head back up the mountain. It’s a tough stretch, so please make sure that you carry enough fuel. Four miles after leaving the aid station you’ll reach the previously encountered T at the top of Dog Meat, but this time you will continue straight ahead to the Kennedy Rollers. A further 1.5 miles of short and steep hills will bring you back to the Wood Road Aid Station. Leaving the Wood Road aid station, you’ve got a couple of short uphills before a big downhill back to the Hicks Road Aid Station and Quicksilver Park. There are some pretty loose and rocky sections of this downhill, so make sure that you mind your step. Leaving the Hicks Road Aid Station and re-entering Quicksilver Park, you will now have a chance to see some of the cool historic features that you may have missed in the early morning darkness. One of the more notable features is the old rotary furnace which was originally used to extract mercury (“quicksilver”) from the cinnabar (mercury-sulfide) rocks. After passing through English Camp, you will descend the steep and rocky Deep Gulch Trail back to the Hacienda parking area where the race started. As tempting as your car may be, it’s still too early to call it a day. You’ll leave the Hacienda Aid station the same way that you did at the start of the race. This time, after about a quarter of a mile, instead of turning left onto the English Camp Trail, you will turn right onto the Hacienda Trail where you will encounter a series of particularly steep uphills and downhills that we affectionately call the Hacienda Roller Coaster. Fortunately, it’s only about three miles to the next aid station. Once you make it to the Mockingbird Aid Station, your resolve will surely be tested. 50k finishers with beverages in hand and plates of food will tempt you to call it a day. Resist the urge though, and you will be treated to a tour of the rest of Quicksilver Park. 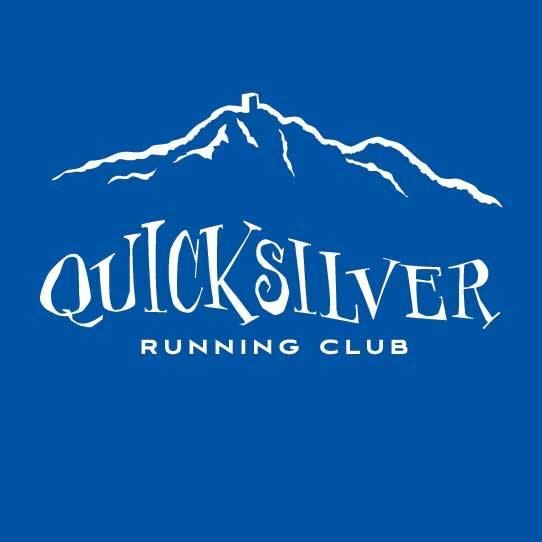 Leaving Mockingbird, you will be running on the finest singletrack trail in the park, the New Almaden Trail, which the Quicksilver Running Club has adopted and performs hundreds of volunteer hours annually maintaining. After a mile or so on the New Almaden Trail, you will turn left onto the Buena Vista Trail. Buena Vista is a moderately steep and rocky trail that climbs up to the smooth and flat Randal Trail where you’ll have a brief respite for about half a mile before making a switchback right turn onto the Day Tunnel Trail and right again onto the Great Eastern Trail. A short steep climb on the singletrack is followed by a right turn onto a steady but gentle fire road climb on the April Tunnel Trail past some cool mining relics and the Mine Hill Trail which will take you to the Bull Run Aid Station, hosted by our sister club, the Stevens Creek Striders. A special thanks goes to our friends a few miles away: The Stevens Creek Striders. We have been fortunate to have their commitment to manage a huge aid station at our event since the early 90’s. This year they will again be hosting the Bull Run Aid Station. Be sure to thank them for their tireless support. THEY ARE THE BEST! Upon reaching the Bull Run Aid Station, you can look forward to an enthusiastic greeting from the volunteers and the knowledge that you won’t have to ascend any higher. Both the 50k and the 100k visit this aid station twice, so you’ll be sure to encounter some of your fellow runners. Please be careful to exit this aid station in the proper direction, as other runners may be at different points in their runs and heading in a different direction than you are. From your direction coming into the aid station, you will be turning right. We’ll have signs on the trail, but please take a second to make sure that you don’t get distracted by the rush. Once you leave the aid station, your next turn will be to the right for a short lollipop loop through the Catherine Tunnel. Unfortunately, the Catherine Tunnel isn’t actually a tunnel any more, but there is a great view of the Almaden Valley. Leaving the lollipop loop, you’ll turn right again to continue descending the Mine Hill Trail. After about 0.8 miles you’ll turn right onto the Prospect #3 Trail for a steep singletrack descent terminating back at the New Almaden Trail after another 0.8 miles. Turn left on the New Almaden Trail to enjoy Quicksilver’s finest singletrack for another 2.3 miles. There are a few side trails that you won’t want to take, so please be on the lookout for the correct course markings. At the end of the singletrack, you will reach a large fire road. Take a hard right to continue downhill on the Mine Hill Trail until it reaches a gravel road and some porta potties. Take a left on the gravel road and continue about a quarter of a mile to the McAbee Aid Station. The McAbee entrance to Quicksilver Park is one of the most popular entrances. The close proximity to a residential neighborhood guarantees a steady stream of dog walkers, hikers, and nature spotters. This is also a good place to see you crew or pick up your pacer. The locals tend to arrive early in the mornings, so you shouldn’t have any trouble finding space on the trail to pass. Shortly after leaving the McAbee Aid Station, you’ll encounter a brief climb where you will continue straight before a short downhill and flat section. About 1.5 miles after the aid station, you will begin the long steady climb back up to the top of the hill while you overlook the Guadalupe Reservoir. About 3 miles after leaving the McAbee A/S, the Mine Hill Trail you are on will make a 180 degree left hand turn, but you will instead continue straight onto the Providencia Trail. Stay on the Providencia Trail for about 0.8 miles until it terminates with a short steep climb back to the Mine Hill Trail. Take a right on Mine Hill and continue straight for 1 mile, passing the Prospect #3 Trail on your left that you took earlier in the race, and arriving back at the Bull Run Aid Station for your final aid station visit. If you’ve made it this far, you’re doing fantastic! It’s just a mere 5km fun run to the finish! This time you will leave the Bull Run Aid Station by continuing in the direction you were heading before getting there. The trail changes from the Mine Hill Trail to the Castillero Trail. This is the same section of trail that you covered way back at mile 2.7. About 0.6 miles after leaving the aid station, continue on the Castillero Trail as it makes a sweeping turn to the left. After that, it’s a brief downhill back to English Camp, where you will take a left back to the Mine Hill Trail. Turn right on the Mine Hill Trail and continue downhill for 0.7 miles before continuing straight onto the Capehorn Pass Trail for another 0.2 miles. After two quick climbs, turn left onto the Hacienda Trail. After two quick climbs and one plunging descent in 1 mile (no turns now), CONGRATULATIONS! YOU’VE REACHED THE FINISH!